Wynd Halo + Home Purifier Review – Keep Your Home Healthy? It doesn’t matter if you live in the pristine countryside, or you live in a large city. You’re going to be able to find good reasons to run an air filter. That’s true for people who have issues with allergens like pollen, and it’s true for people without any allergic issues whatsoever. But many people believe the classic air filter can be improved. Can it? That’s really something you’ll have to decide for yourself. 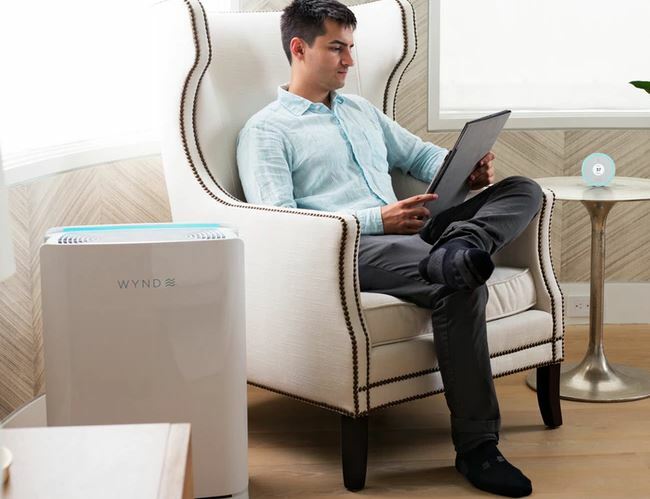 The Wynd Halo and Purifier system is supposed to be the world’s smartest air purifier because it’s been combined with an air monitoring system. That system is designed around a powerful set of multi-purpose sensors, a highly adept purifying system, and some smartly designed coordinating software. More specifically, the Wynd Halo was constructed with a ten-sensor array to keep an eye on smoke, pollution, allergens, germs, and so on. Using so-called Air ID technology, it can classify pollutants in the air, which allows you to take the most appropriate course of action in response. Similar to a smoke detector, the Halo is constantly monitoring the air. That allows it to instruct the Wynd Home Purifier about the quantity of contaminants around you. For instance, the humidity sensor can keep an eye on both dampness and mold risk, while the noise sensor can read current and peak audio levels. Once identified, the Halo communicates that environmental information to the Wynd Home Purifier, which quickly moves to act and remove those contaminants. It’s supposed to do this automatically, while allowing you to program specific responses to changing environmental conditions. Among the numerous benefits of this kind of adaptability, you’ll encounter fewer noise issues and longer-lasting filters. The Wynd Halo measures roughly 3.8 x 3.8 x 0.9-inches, and weighs about one third of a pound. The Wynd Halo actually looks similar to a fire detector. It’s a round unit with a white chassis, and true to form, it’s intended to keep an eye on air quality. The Halo can sensor light, noise, PM10, PM2.5, and PM1 pollutants. It also detects pollen, dust, smog, smoke, pet dander, and a variety of chemicals. Though you could get away with it, you probably don’t want to hang the Halo up on the ceiling because you wouldn’t be able to properly use the display. It’s better placed on a table, counter, or somewhere else that’s easily accessible. Though it connects through Bluetooth or Wi-Fi, and is powered with a Micro-USB power input, so those kinds of taller installations are feasible. Even though the Halo’s LED display is fairly small, it’s possible to get updates about air quality without getting up-close to it. That’s because a colored LED runs around the edge of the Wynd Halo. It turns blue when air quality is perfectly healthy, yellow when it reaches a higher threshold of pollutants, orange when it detects smoke, and red in the presence of CO2. And then there’s the purifier. 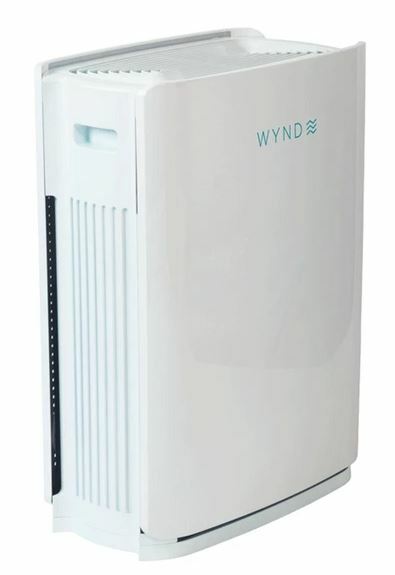 The Wynd Home Purifier measures 24 x 17.3 x 10.2-inches, and weighs just shy of 23-pounds. Honestly, it looks similar to almost any other home purifier on the market. 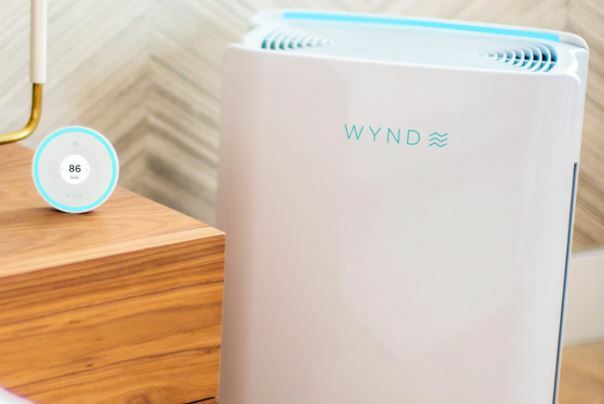 Home purifiers tend to look like glorified trash cans, the Wynd isn’t much of an exception. But what really matters are the filters inside of it. 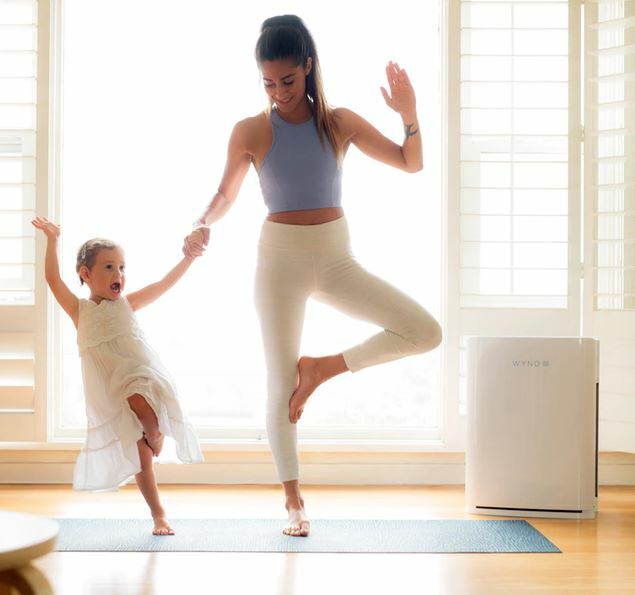 Within the purifier, you’ll find a pair of HEPA filters to clear out allergens and pollutants. Wynd claims these will affect odors, which is initially hard to believe because the vast majority of all HEPA filters do not include built-in charcoal. But these filters happen to be an exception to the rule. Though the unit is fairly modestly sized, it’s actually made to clear 1,200 sq. feet of space. It can completely cycle through that space in about half an hour. At maximum power consumption, the purifier will draw about 60 watts. That’s actually pretty powerful considering most of that energy is going straight into the fan. As with the Wynd Halo, the Wynd Purifier connects wirelessly using Bluetooth or Wi-Fi. The filter used by these devices is HEPA V Series, which are made to clear a pretty big range of different pollutants. It’s a multi-layered filter composed of three total layers. The first is an antimicrobial pre-filter, which was interlaced with a germ-killing silver compound. The second layer is coconut shell activated carbon, which was placed to remove toxic gas, but it’s also partially responsible for scrubbing smells. The third filter is the actual HEPA filter along with a thin sheet of carbon filtering. That’s intended to get germs, allergens, pollutants, and other small particulates. You can use smart purification scheduling to quiet the unit while you sleep, and then get it started once you’re up. It can be turned off when you need silence, or thrown into its highest speed in the hours before you return home from work. Because it can be set to only trigger when pollutants have accumulated, you can save on energy costs and filter costs at the same time. Moreover, there’s no need to manually control the filter because the AI will handle everything for you. The most you’ll have to do is consider changing the location of the Wynd Halo sensors. Air pollution is a strange thing. People understand that when you put a bunch of chemicals into a lake, the creatures living in that lake might react poorly. Essentially the same thing is true of the air around us. Unless you have some type of chronic respiratory condition, most pollutants in the air are unlikely to be a deadly threat to your health, at least in the short term. But even for people who don’t have those kinds of respiratory issues, air pollutants have been shown to be horrifyingly dangerous with long term exposure. Studies have found air pollution actually increases your aging on the cellular level. Similar studies have found that people who live in heavily polluted areas predictably have shorter lifespans, especially people who live around highways. Using an air purifier like the Wynd Halo system can help address those kinds of issues head-on. For people who have respiratory issues, being able to remove pollen and dander from the air can be a pretty big improvement in quality of life. And for anyone who’s dealing with smog or smoke, being able to monitor and remove those pollutants from your environment can have long-term health impacts. Unfortunately, it’s tough to motivate people to obtain long-term benefits. That’s especially true of health benefits that are hard to directly see or immediately feel. Which is why devices like the Wynd Halo are so helpful. They protect you without requiring you to take a bunch of extra steps. It’s an almost set-and-forget solution. If you plan on planting the Wynd Halo in an unreachable position, you can still manage the device through the free Wynd app. It supports iOS and Android, so you don’t have to worry about compatibility issues. Though if you use a less popular phone, like a Windows phone, you may have to jump through a few extra hoops to get the installation software working correctly. Once the is app loaded, you can check out essentially all the data available on the Wynd Halo itself. That allows you to keep an eye on air quality, even when you’re actually around to do so. You can even setup a few notifications and alerts through your smartphone, if you want to keep up-to-date with environmental changes as they occur. Because Wynd made these purifiers to be location sensitive, allowing the device to tap into local air pollution data. 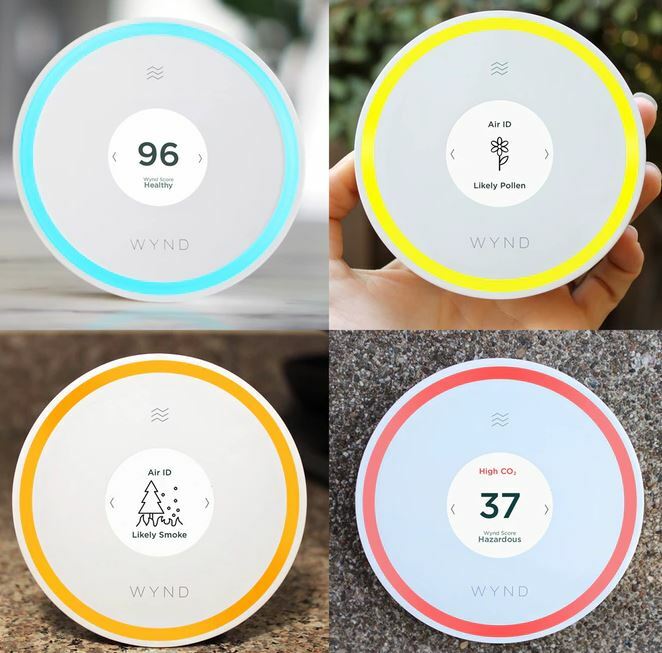 How does the Wynd Halo stack up compared to an ordinary over-the-counter air monitor system? Most similar monitors will only pick up temperature, humidity, CO2, and some basic odors and toxic smells. The Halo picks up so much more, and it includes a variety of customization options. It can be connected to activate alongside thermostats, lights, other purifiers. 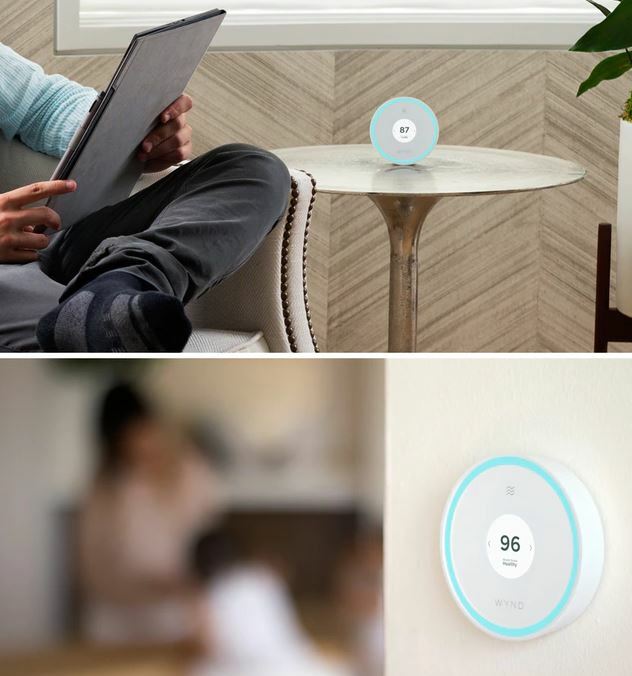 Wynd Halo has compatibility with Amazon Alexa, Apple HomeKit, and Nest. With time, Wynd says they intend to offer more of these kinds of optimizations through software updates. As a result, you can probably expect the Wynd Halo to become even more friendly to smart-homes in the future. The Wynd Halo comes with an extra filter, but you’re going to need to replace your filter about three times a year. With these fancy filters, you’re going to end up spending a chunk of change for replacements. Something to keep in mind. Who Should Choose the Wynd Halo + Home Purifier? Most people can make a stunningly effective air purifier for about $10. All you need is a fan, a HEPA filter, and some carbon filtering. Put the carbon filter over the HEPA filter, and put the HEPA filter over a fan. 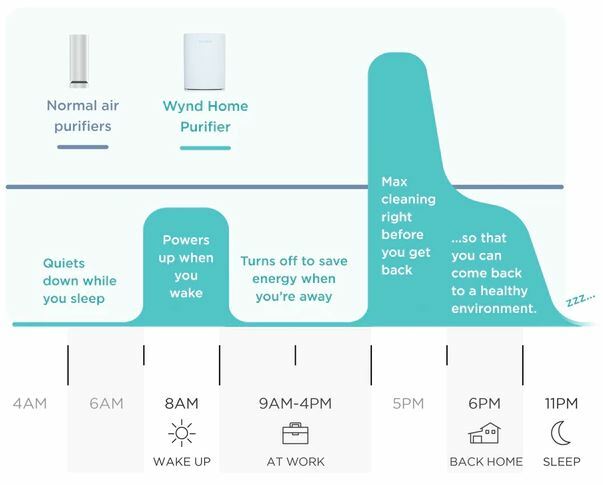 And for about $10, you’ll be able to do 70% of what Wynd offers with their Halo and Home Purifier. But that last 30% can be pretty important. 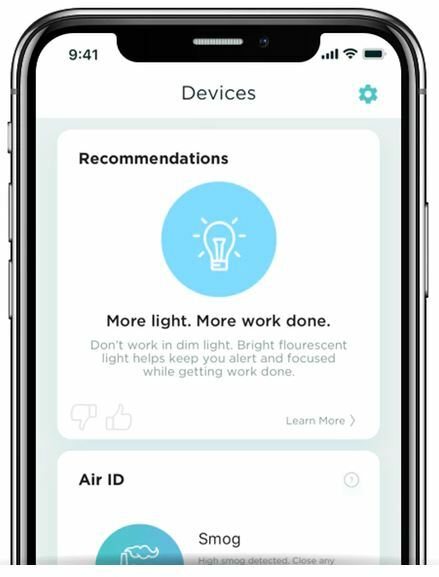 The Halo provides a bunch of handy sensors that give you actionable information about environmental conditions within a room. Wynd’s solution isn’t only about pollution, but noise, time spent on micromanagement, efficient use of electric energy, and so forth. The idea is to make their purifier totally unobtrusive. Which is why it can increase or decrease the intensity of the fan inside to accommodate your sleeping schedule, to accommodate heightened levels of pollutants, and so forth. After you’ve got it programmed how you’d like it to work, you really don’t need to continue managing it. The Wynd Halo and Home Purifier are not for everyone. For people looking for something cheap and simple, this isn’t the right way to go. 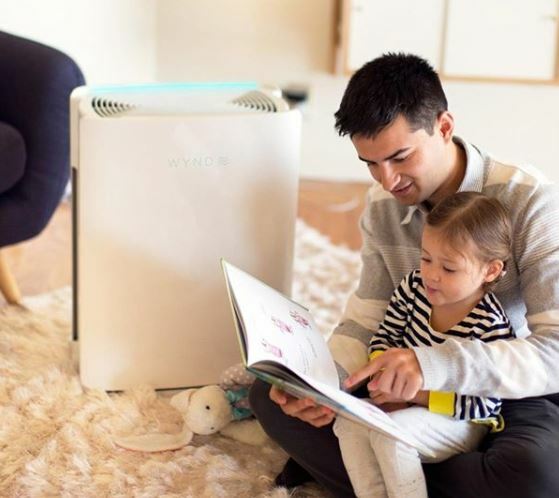 But for people who are serious about protecting themselves from the health hazards of air pollution, in the long term, Wynd has some pretty definitive advantages over ordinary air purifiers. Additionally, for anyone with serious allergic issues that need regular monitoring, the Wynd Halo seems like a very strong choice.